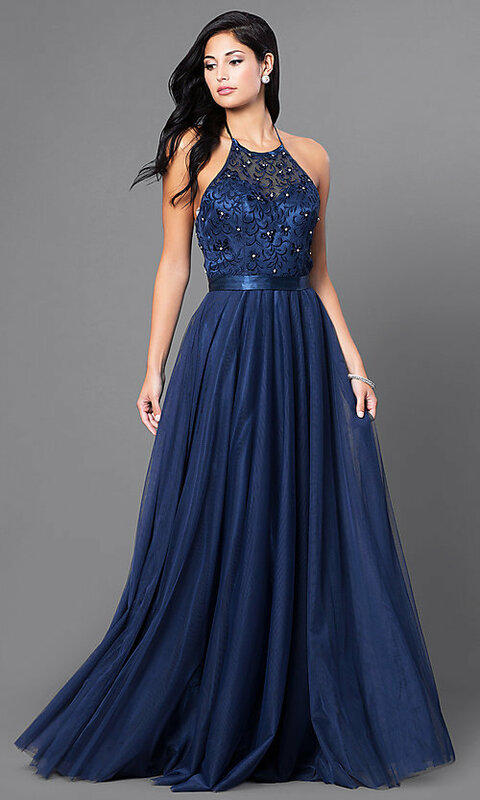 A stunning silhouette will be yours as you celebrate your next formal event in this embroidered halter-top dress by Elizabeth K. As a long prom dress or gala gown, this beautiful designer dress will take your breath away. The floral-embroidered sheer-illusion halter top on this formal gown is embellished with beads to make you shine. Shimmering satin is a glamorous touch on the waistband of this designer dress with thin satin halter straps that wrap around the neck in a bow tie that gently dangles on your open back. The long full tulle skirt gives you the perfect reason to dance the night away in glorious style in this full-length formal gown.